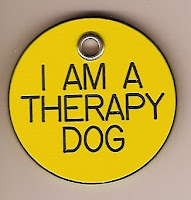 After I get done reading all of the material I received in our packet today, I'm going to make some phone calls to find out where and when we can make our first therapy visit. I'm so excited about this, but also a little bit nervous since I'm not sure how people will react to such a big, drooling dog. I'm sure we will have some interesting experiences. WOW congratulations! We are so impressed and proud of you! Hooray! You're an inspiration for us, slightly less-well-behaved canines out there who very much want to get our certification some day. Bravo!! Hooray for you!!! 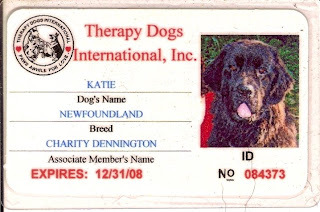 Katie looks so cute in her ID picture! Can't wait to read about your adventures together! So very exciting! Congratulations to the whole Happy Haus! This is such an achievement! And I can tell you how people will react...they will be thrilled! Such a gorgeous creature come to call? Everyone will love it! Congratulations! So happy for you Katie ! You make your family proud ! Wonder if little brotha will follow ?